Did you know that 64% of data breaches are caused by human error, either by an external vendor or by an employee? That’s why it’s very important to make sure you’re informed about the type of information that needs an extra layer of protection. A good shredding company will give you expert assistance in ensuring the privacy and safety of your personal or business documents. Read on to find out what you should look for in a document shredding provider. Make sure your chosen document shredding company has an understanding of the nature of your industry and whether there are any laws or rules pertaining to privacy and security. The Australian Privacy Act 1988 has strict rules on holding personal or sensitive information. 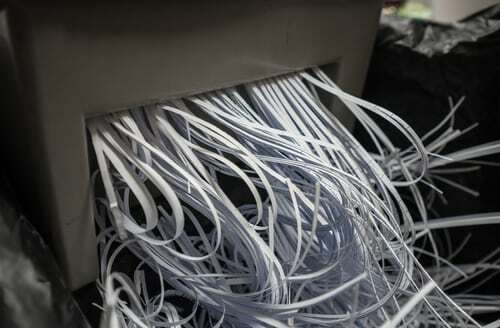 A good document shredding company will be able to help you ensure your compliance with this. Consider choosing a company that provides lockable storage boxes for documents prior to destruction. All documents should be shredded in a secure area where the document handler is the only one with access. We recommend looking for a company that does not outsource operations to any other party for an extra layer of security. When it comes to the security of your personal or business information, you deserve the best that the industry has to offer. Ensure your chosen company is fitted with state of the art shredding machinery that will destroy your documents beyond recovery. Choose a company that can issue you with an official Certificate of Destruction upon completion of each and every job. This is not only for your peace of mind but can provide legal protection in the rare case that it is necessary. If you’re in Australia, you should also choose a business that is certified by the National Association for Information Destruction. Depending on the nature of your business, your document destruction needs might change from week to week. A good shredding company will be able to organise one-off jobs or regular services. Many will provide a pick-up service that can be utilised as often as once a day. Keep looking around until you can find a company that will make the document destruction process as easy as possible for your situation. If you’re in a business that goes through a lot of paper, it’s important to think about your impact on the environment. Consider finding a shredding company that recycles paper waste after its destruction. Do make sure that the company shreds the documents before recycling to avoid any risk of retrieval. If you’re located in Melbourne In Confidence can provide tailored and secure document destruction services for your needs. Whether you’re wanting to organise a one-off job or regular collection, the team at In Confidence takes your security seriously. Give us a call on 1300 723 187 to discuss your requirements today.